In the past, Congressional oversight hearings might have produced some evidence that challenged the military’s self-satisfied conclusions. But today, politicians are so fearful of being accused of “criticizing our troops” that they fail to scrutinize the performance of those who lead them. Allen’s errors have been huge. Perhaps the largest was his contention that green on blue killings spiked last summer because Afghan troops were fasting during Ramadan. However, his complete disregard for the evidence of failure in Afghanistan even when the rest of the government finally begins to admit it also reflects on his separation from reality. For the past month, the U.S. military has experienced something not seen for five years in Afghanistan: No combat deaths. Afghans now lead more than 80% of combat operations and control areas covering more than three-quarters of the population, according to U.S. military officials. Just as the U.S. toll has dropped, Afghan security force deaths have risen sharply. 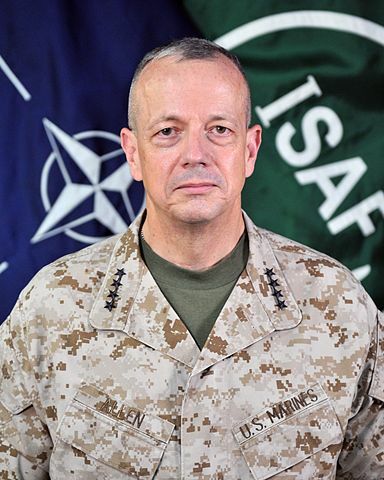 “The Taliban are targeting the Afghan Army and police to try and show the populous the Afghan Security Forces cannot adequately protect them,” said Col. David Lapan, spokesman for the chairman of the Joint Chiefs of Staff. “They are trying to undermine the future of the (Afghan Security Forces),” he said. Having reached their peak of 352,000 last year, more Afghan security forces will also bring more casualties as well, according to defense officials. The argument that Afghan fatalities (which don’t matter enough to be counted by CNN, apparently) are increasing mainly because Afghan National Security Force size has become so large is just as false as the previous attempt to blame the spike in green on blue killings on increases in Afghan troop numbers. Completely missing from this explanation is how inadequate the vaunted US training of the ANSF has been and how even the claim of 352,000 as the ANSF force size (see the link above on evidence of failure for an example of staffing at an Afghan Border Police facility) cannot be supported after the disruption in training while attrition continued at its high rate. Why won’t the military admit that putting poorly trained troops in charge of operations is a recipe for getting large numbers of them killed? Note also that US military sources dwell on the decrease in civilian casualties and while they note that the Taliban now seem to be targeting Afghan forces, they omit the UN’s observation that women and girls now also are being targeted. It should also be pointed out that there were media reports last week that child deaths were increased according to a new UN report, but that particular report still doesn’t seem to have been posted on any UN website that I can find. NATO even publicly disputed the finding and it’s unclear to me whether the absence of the full report is due to this protest or if the report had somehow been leaked to the press before it was due for official release. Given the obvious spin away from reality in today’s CNN story, don’t look for Afghanistan under Dunford’s command to be any more successful than it has been for the last decade plus. Interesting about Afghanistan, but the reason Allen can not be confirmed and will not face a hearing is the Petraeus scandal, no? Striking how nobody questions why they have continued in Afghanistan for 12 years after Bin Laden was known to have escaped the area from Tora Bora. I still don’t believe Bin Laden was the real reason for bombing Afghanistan anyway. However, you are correct in thinking that no oversight is given due to fear. We have the most unworkable, fearful, less loyal to the US Congress ever. So, when the Taliban and AQ are our friends everything is honky dory. When they aren’t our friends, the humans on this earth die or give away freedoms. However, the tens of thousands of pages of e-mails between Jill Kelley and General Allen must have been an interesting dialogue. Perhaps, they were discussing “Clean Coal”. But Jill and her Twin Natalie have an unmatched track record for destroying military careers, contractors, spymasters, and husbands. Jill should get the credit for the General’s premature retirement. Allen will get rewarded for his Afghan genocide by a highly paid military contractor job. And Allen will be pimping the next fossil fuel war on cable tee vee. Jill did get a medal from the JCS and was pinned by P4 himself. Who else got medals? The coward Drone Assassins got a medal that outranks the Bronze Star. And Afghanistan remains the Greatest Military Failure, as planned by PNAC and neo-cons.